We’re not the only species trying to fish around here. The U.S. Fish and Wildlife Service’sMaine Coastal Islands National Wildlife Refuge encompasses over 8,200 acres on more than 55 islands and coastal parcels. 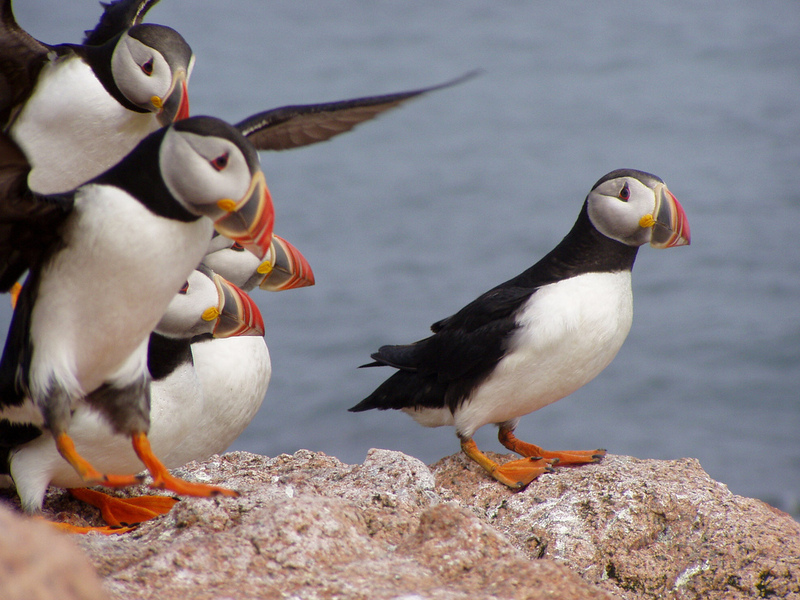 On eight of these islands, seabird restoration projects have been established to encourage and maintain nesting of Atlantic Puffins, Razorbills, and Common, Arctic and Roseate Terns. Working on a seabird island is, I can attest, challenging, and the summer researchers (many college students) stationed on the islands must put up with heat, harsh weather, primitive living conditions and not much contact with the outside world as the islands are closed to visitors from April through August. (They do apparently have enough access to modern conveniences to blog about the experience, so do check that out. )These researchers document numbers of pairs, numbers of chicks produced, what the parents feed those chicks, and how many survive to fledge. The programs have been highly successful, with increases documented in nesting pairs of all five species over the 30 years the projects have been underway. Now, however, some troubling signs. 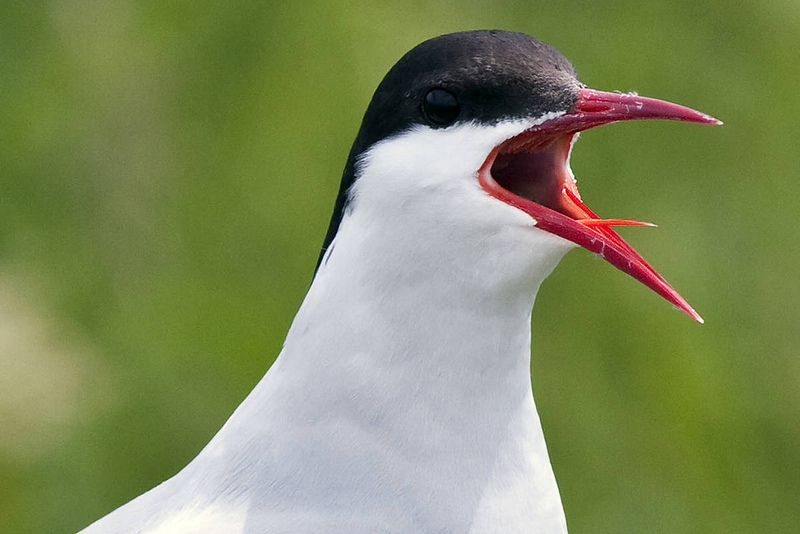 After 25 years of upward trends, numbers of breeding pairs of Arctic Terns in Maine have dropped by 42 percent, from 4,224 pairs in 2008 to 2,467 pairs in 2012. Linda Welch, Refuge biologist, reports that not only are the numbers of pairs declining, but among those pairs that do nest, fewer young are successfully fledged. Arctic Terns make the longest migrations of any birds in the world, traveling more than 36,000 miles round trip skipping out on the northern hemisphere’s winter to spend those months off Antarctica. They then fly north again to breed from New England up to the high Arctic. Scientists speculating about the decline in breeding success in these birds posit that they may be failing to find sufficient food while overwintering, and are returning to the breeding grounds with insufficient body reserves to reproduce (if they return at all). Seabirds live a long time, and one lost breeding year would not be catastrophic, but this assumes that one bad year doesn’t turn into five, or ten. Additionally, the not-enough-food-in-the-Antarctic hypothesis does not necessarily explain why the birds that do breed seem to be less able to successfully raise their young. A likely reason: the same problem they may be facing over the winter. Not enough fish. 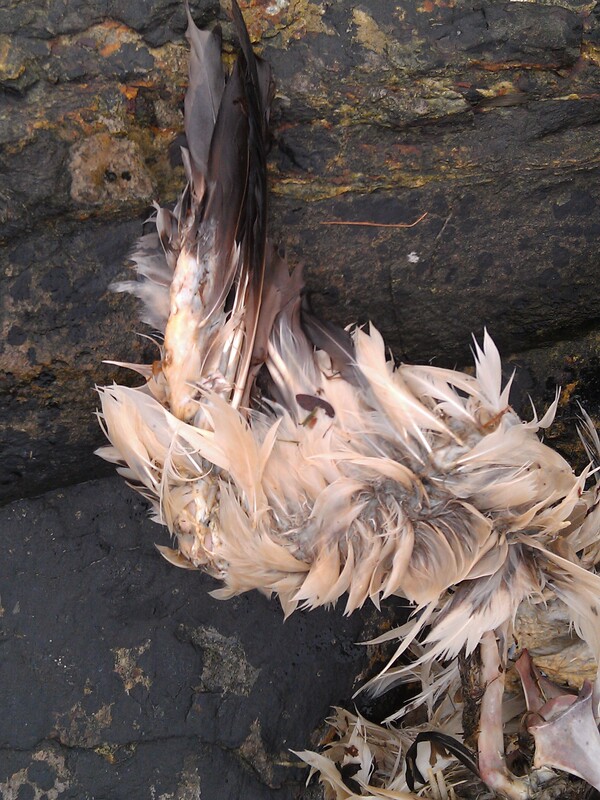 The same saga is playing out among Atlantic Puffins, which also rely heavily on herring. Unable to find sufficient numbers of that prey, Puffin parents have been returning to the nest with butterfish, a warm water species gradually expanding its range northward while the herring, intolerant of warmer waters, are apparently moving deeper or farther north, out of reach of the beaks of terns and puffins in Maine. The broad, oval-bodied butterfish are mostly too wide for the young Puffins to swallow, and, like the terns, the birds gradually starve, surrounded by piles of food. There is, of course, no way to link climate change to the death of a particular chick, or to a particular freak storm, or a single drought year. But we have overwhelming evidence of all these trends all pointing only one way, and as I watch this video of a puffin chick trying, for hours, to choke down a butterfish, I can think of no sterner indictment of what we have done than that fuzzy head and flat black eye gazing into a camera it doesn’t even know is there. I am just now recovering from my disappointment over missing the SEANET training in Awendaw, SC a week and a half ago. Due to an improbable string of mechanical problems, airport power outages, and weird weather snarling air travel in the Northeast, I didn’t arrive in Charleston until the training was already over, so I just slunk off to my motel feeling sorry for myself. 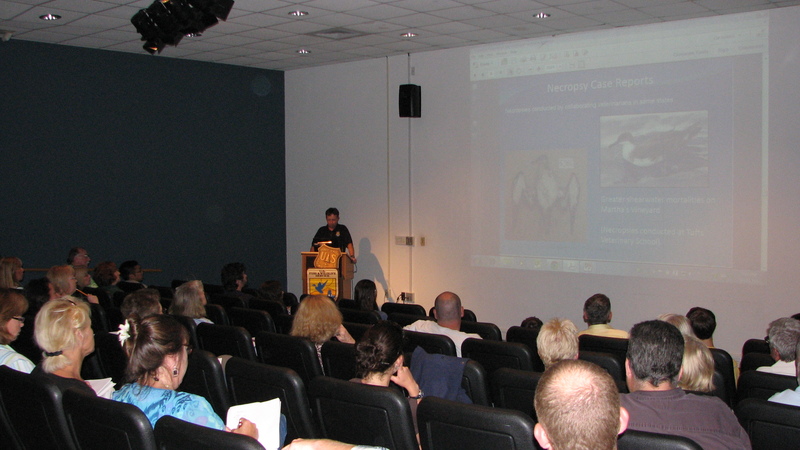 Fortunately, John Stanton, true friend of SEANET and the SEANET blogger, swept in with powerpoint at the ready and gave the presentation in my stead to a full house of prospective recruits. 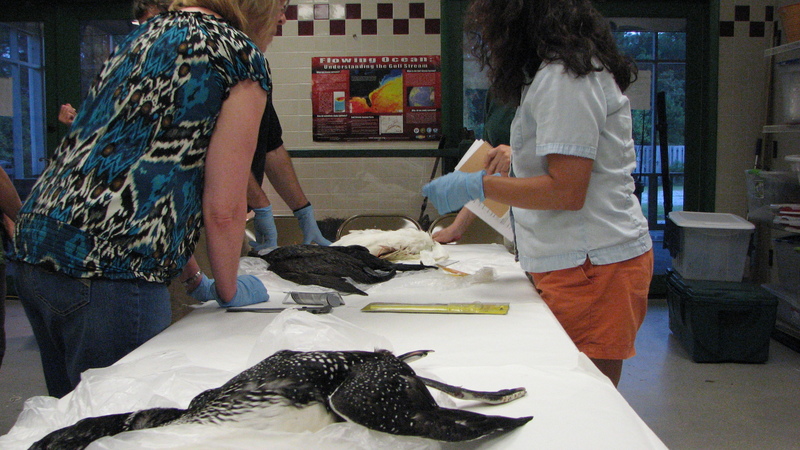 Attendees even got to handle actual carcasses and learn, hands-on, how to tag and measure them. Thanks to John, Jennifer Koches and Craig Watson and to Sarah Dawsey for bringing the whole thing off to the universal praise of everyone who attended. I am so grateful! By the next morning, I was feeling sulky about missing the session, and now guilty too, for having a day to explore Charleston without having earned it by working. I also began to realize part of why I was so bummed: most of the time, I run SEANET all by myself from a computer at my house. When I get the rare chance to get out and talk to actual humans, I get inordinately excited about it. My disappointment at getting that chance was assuaged by the morning’s activities though. John and I met at 7:30am to head out the Center for Birds of Prey in Awendaw. John once worked with the Director of their medical clinic, Debbie Mauney, and we were slated to meet with her and the Center’s Executive Director, Jim Elliott. What was intended to be a quick visit turned into the proverbial three hour tour, and John and I were both amazed at the quality of the Center and the dedication of its staff. The extensive, wooded grounds are beautiful, the collection of captive birds of prey from all over the globe impressive, and the medical facilities (including oiled bird washing building) the envy of most any wildlife veterinarian I’ve ever known. What stuns me is how few people in the area know this place exists. It’s open to the public, even offering live bird demonstrations and stations to view vultures feeding. Jim, Debbie, and all the staff have struck a fine balance between conservation, rehabilitation and public education, and I cannot recommend their Center enough. If you’ll be anywhere near Awendaw anytime soon, it’s worth a substantial detour. 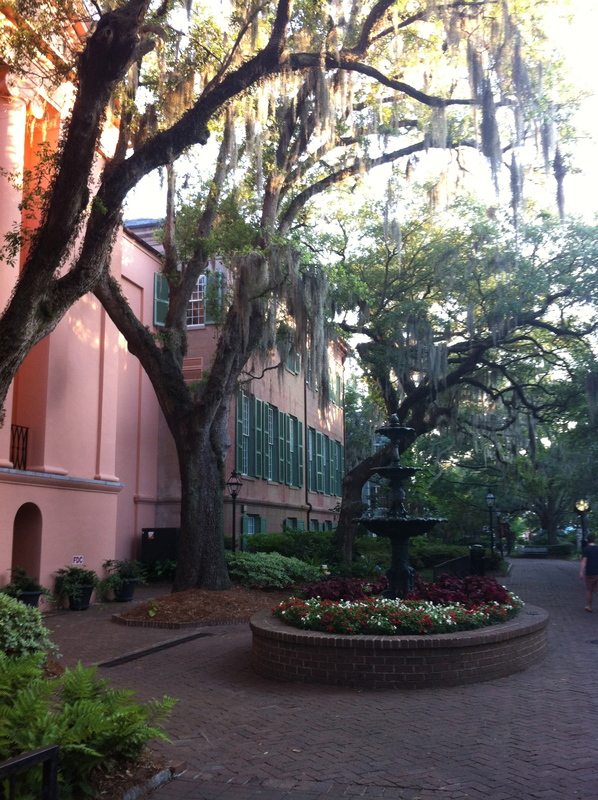 After our visit, John took off for home, and I tried not to feel too guilty as I went birding and then for a run around Charleston through the moss draped trees and shaded courtyards of the College of Charleston and down to the stately houses fronting the Battery. But you should feel a little sorry for me. I am unaccustomed to tropical heat, and I was withering by the time I had to board another accursed plane and head back to New Hampshire. Naturally, the trip back was without delays or trouble of any kind. In fact, we got into Manchester a little early. Alas, Seanetters, alas. This only means I will have to visit South Carolina again soon to meet a new crop of fresh volunteers. The hardships I endure for you. What do you think of that!? Bird B is far more intact than Bird A, but still poses some challenges. The feet are useful, and in the photo, it’s clear that all four toes are webbed, marking the bird as a pouchbill (cormorants, pelicans and such.) 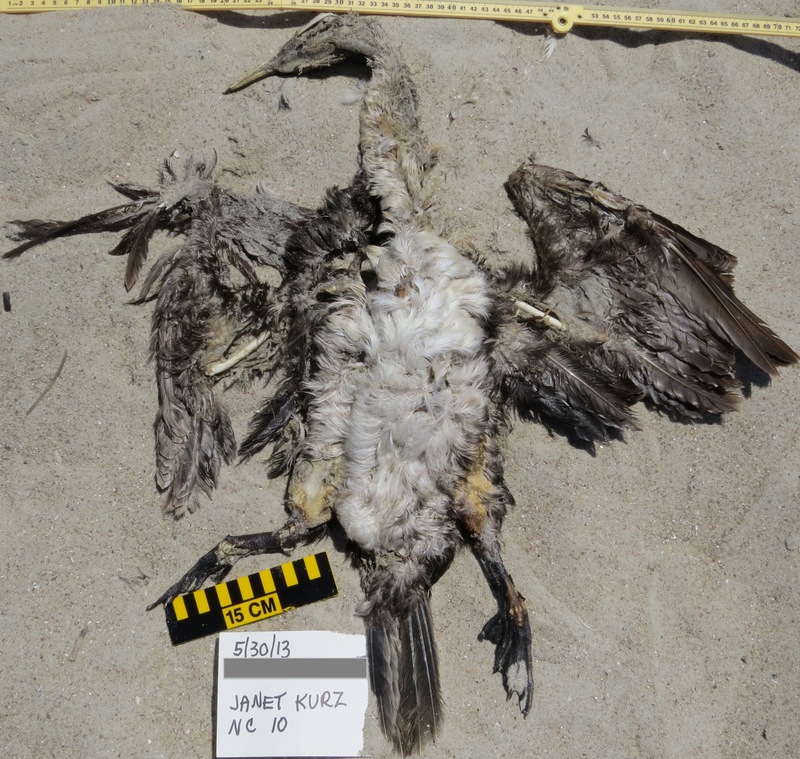 Though the bill is not fully visible here, we can say it’s no pelican. The wedge-shaped tail says cormorant. But which kind? We don’t have measurements on this bird, and devoted blog reader BiologistOnTheEdge (not her real name) points out that in field guides for normal people (i.e. 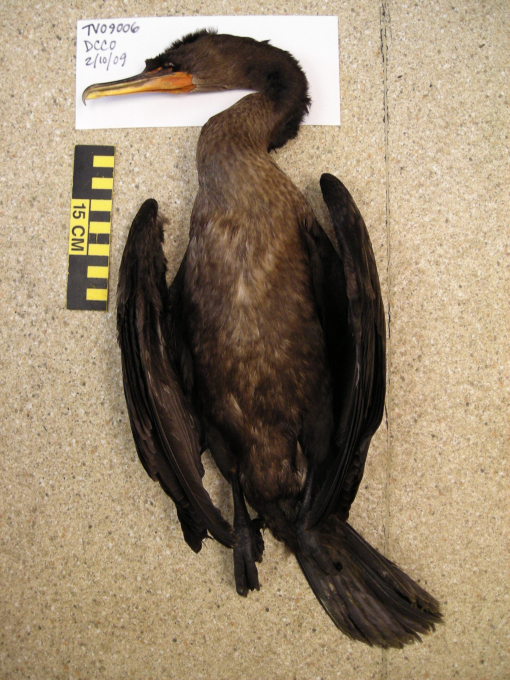 live bird field guides), cormorants have reported body lengths of over 90cm, and this bird looks smaller than that. It’s a point that got me thinking–what is the deal with those body lengths given in live bird guides? How can you even judge that in a live bird? And is it the measurement from bill to tail tip? Or to toetips? In any case, it’s true that this bird is not 90cm long. 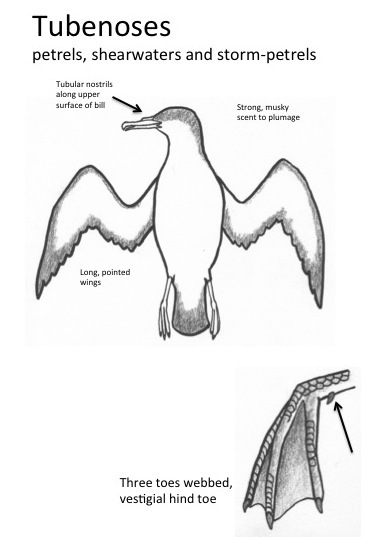 But it is a cormorant nonetheless. What Sibley notes as “variation in color of juveniles” is, therefore, quite substantial, and to my mind would include the amount of paleness in our Bird B, especially noting the lack of contrast between breast and belly. And though I don’t take much stock in wing chords guesstimated from photos, this one does seem small enough to be a double-crested. As usual, I am open to arguing this one back and forth, so if you think I’m missing something, please, dear readers, do call me out. I know you’re not shy about that anyway. 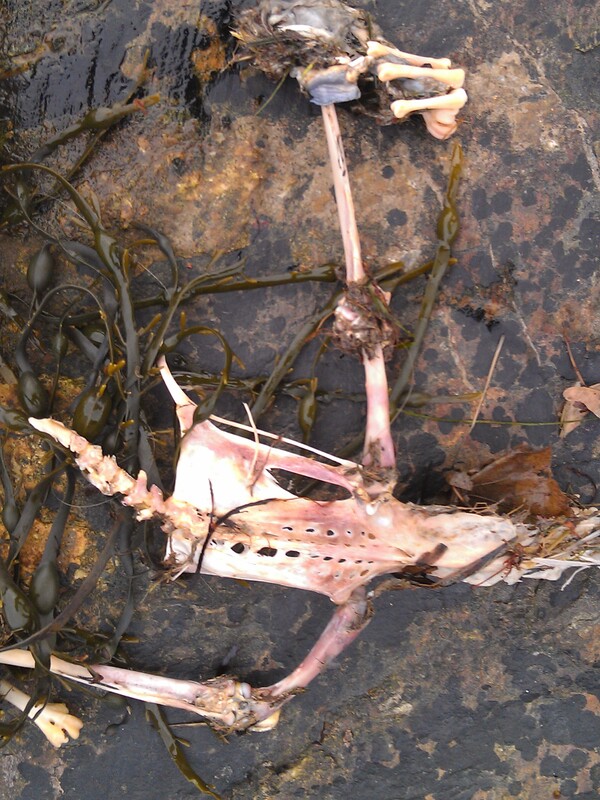 Helen Rasmussen, who walks in Portland Maine, found this bedraggled, waterlogged, mostly skeletal and entirely inside out carcass on her beach this month. She suggested it might be a candidate for the Dead Bird Quiz, and I concur. Not certain we’ll get a species i.d. here, but I do have a great deal of faith in you players of the DBQ. Got any thoughts? Bird A’s wing. One of the only feathered bits still recognizable. Bird A’s spine, pelvis and leg bones. Bird B was found by Janet Kurz in North Carolina at the end of last month. Janet apologized for forgetting to take measurements of this bird, but asked if we might not figure it out just from the appearance. I think we can! I think she made the right i.d. on this bird, but let’s see if you all agree. 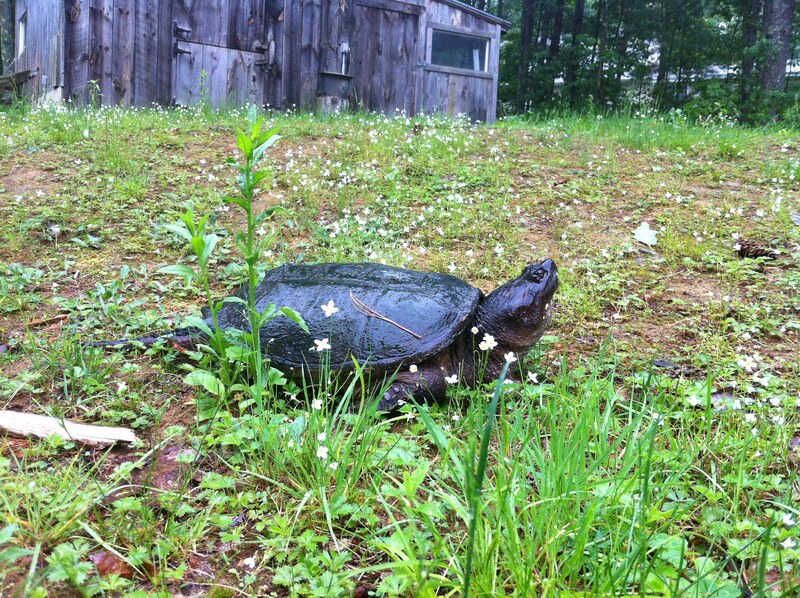 It’s a rainy, meditative morning here in New Hampshire, and as a snapping turtle lays eggs near my radish patch, I fall to the task of summarizing SEANET’s activities over the past year for our funders. I enjoy this activity, in some ways, as it’s a welcome opportunity to look at our many accomplishments. Despite my having been able to devote only 5-10 hours a week to SEANET this year, I think we’ve done alright for ourselves. Have a look at our summary and see if you agree. Thanks to all of you volunteers and supporters for keeping this program going on a shoestring! Working from home dictates a creative definition of coworkers. Here’s mine today. This year, we continued our volunteer recruiting activities, focusing on the Northeast and South Carolina. Trainings in Wellfleet and Duxbury, MA as well as Branford, CT have generated 20 new volunteers so far. Nearly fifty people have signed up to attend a training workshop in Charleston, SC on June 13, and an additional workshop is planned for coastal Connecticut this month. 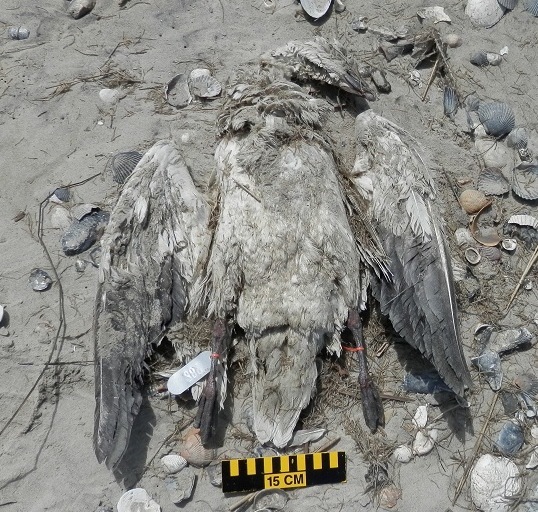 We continue to find new and novel uses for our data, and have entered into an agreement with CapeWind to facilitate the monitoring of seabird mortality before and after the implementation of their Nantucket Sound wind farm project. 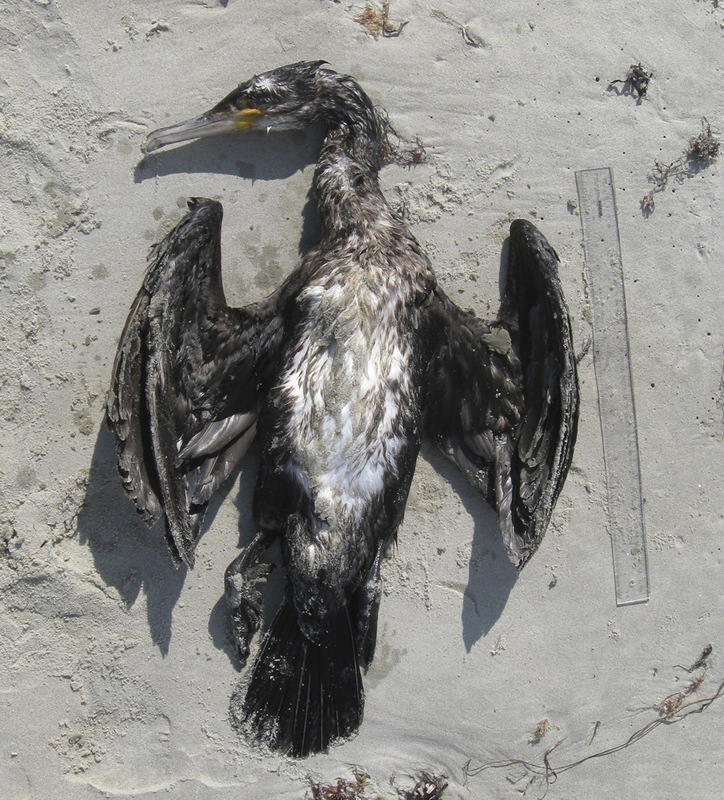 The SEANET database is now automatically feeding into the Wildlife Health Event Reporter (www.wher.org) at USGS, and the public can view all SEANET reports of beached birds. We have made a major push to review and verify all historic SEANET survey reports, and our data verification is now up to date, reflecting real-time mortality and facilitating use by collaborators. Our large archive of frozen seabird tissue samples from SEANET necropsies have been transported to the American Museum of Natural History in New York so that they may be made available and readily accessible to researchers. 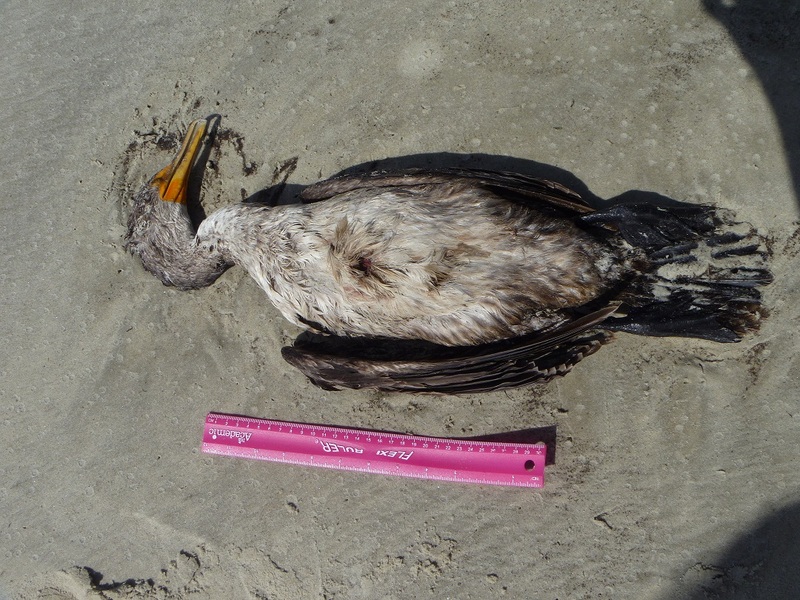 SEANET tracked several mortality events this winter, including heavy die-offs of Razorbills, Common Loons, and unusually high numbers of dead Horned Grebes and Atlantic Puffins. These data will be included in a presentation to the Wildlife Disease Association meeting in July. We also presented a well-attended talk on Common Eider mortalities at the Wellfleet Bay Wildlife Sanctuary on Cape Cod, and for the second year in a row, presented a seminar on citizen science and beached bird surveys to the Tufts Masters of Conservation Medicine students. 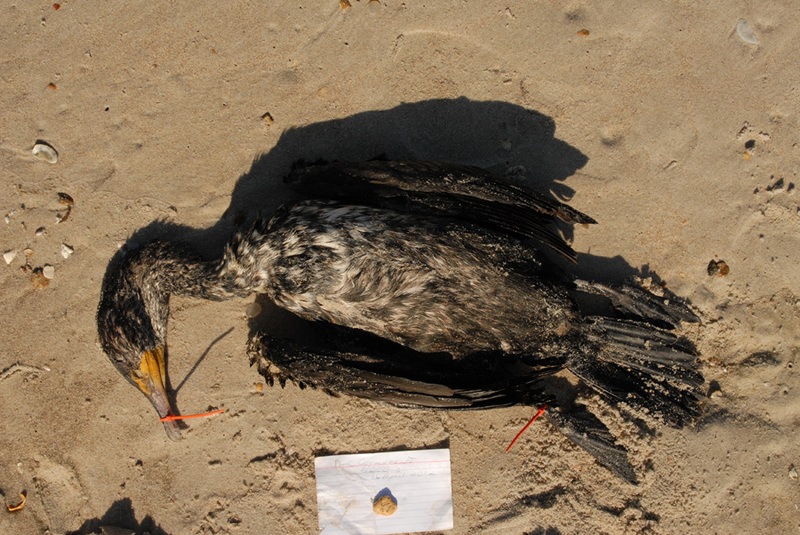 Work on the Guide to Beached Birds of the Southeastern United States is accelerating, and all necessary photos and permissions have been obtained from a variety of sources, including SEANET volunteers, amateur and professional photographers and bloggers, and the Museum of Comparative Zoology at Harvard. Most of the book’s content has been passed to the design and layout team, and printing is anticipated this fall. I’m really excited to be entering the final stretches of the long process of writing this book. As with childbirth and running marathons, I suspect I will need a long period of forgetting before I take on a project of such magnitude again. My continued thanks to John Stanton for being my stalwart cheerleader in this venture.